I’ve had this basket of flowers for 30 years. They’ve moved with us through six states and now I have to decide, will they go with us on this move. It’s a hard decision to make. I look at these raggedy flowers that have been sitting on a shelf in a closet in my basement for the past eighteen years, and I remember the morning that Dad gave them to me: it was a Sunday, two days after I’d given birth to Bobby. Dad had to leave early because it was a long drive home and he had to work on Monday morning; Mom stayed behind to take care of us. Dad would return the following weekend and then he’d get to hold his new grandson for the first time. And, oh, how Dad loved holding babies! On his way out of town, Dad stopped by the hospital, purchased the basket in the gift shop, and sneaked into my room (it was too early for visiting hours to start). He bought red and white because my wedding colors were red and white and he knew I loved red. Dad and I visited for a few minutes then he had to leave. Before he left, he went to the bathroom. Almost immediately after dad closed the bathroom door a nurse opened the hallway door and walked in with Bobby – it was time for breakfast! Dad heard the nurse, and kept as quiet as a church mouse in that bathroom! When she left, Dad came out and he got to hold his infant grandson! He kissed Bobby. He cooed over him. He talked to him. We laughed together and then Dad handed Bobby to me and he sneaked back out. It was our secret! And now, thirty years later, I am standing in my basement looking at the flowers. Tears fill my eyes and my pain fills my heart. 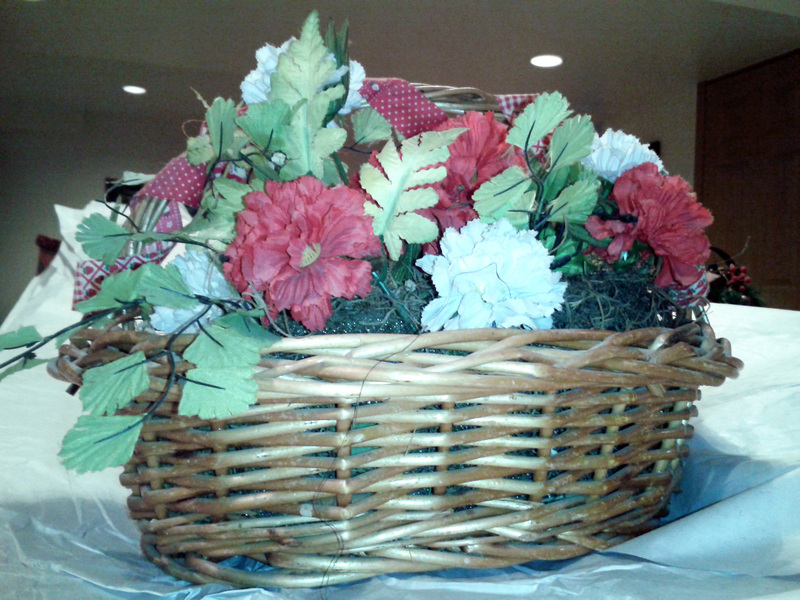 I have to decide what to do with my basket of flowers. 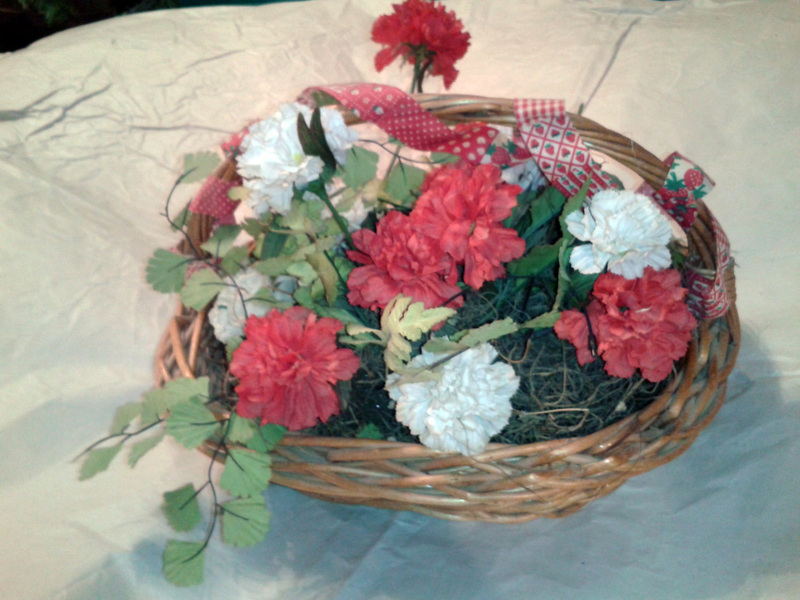 Should I keep the raggedy, dirty, brittle flowers, or should I put them in the throw away pile? If I throw them away, will I be throwing away a part of Dad? Will I lose the memory of that morning? In that moment of intense grief, God comforted me by turning my eyes toward Him – toward heaven. The reality of heaven is that it is eternal. It is a place where life reigns; there is no death in heaven. Things of earth are temporary; no matter how much we cling to them, they will eventually fade away or die. I can cling to things for comfort, or I can cling to God. While I can’t take things into heaven with me, I do think that I will take my mind and my heart. I will take my memories and my love for others. I believe I will recall every love-filled moment of my life as I worship the God who is love. Dad is in heaven… alive! He is worshiping the God he continues to cling to. I know that one day I will worship Jesus alongside Dad. What are you holding on to? Is it something that is temporary that will fade or die? Or are you clinging to the Eternal God who upholds you? So, what did I do with the flowers? I kissed a dusty red carnation. I touched every leaf and petal of every flower. I thought about how dad had touched them. I said a prayer of thanksgiving that Dad is with the Lord. I took a deep breath and I ripped them out of the basket with a spectacular puff of dust, then I threw them in the trash bag. They won’t be going with us on this move. I’m sure Dad remembers that morning. And if I should forget it in this life, I’m sure I will remember it fully when I am sitting next to Dad at the feet of Jesus. … until the next move. Memories are just a reminder of the real visit and our relationship with family. Thanks for the encouraging news.I still miss my father. I am way too sentimental as I could not do what you did!!! I have an artificial flower my mom brought me when my first son was born 47 years ago!!! It sits on the headboard of my bed. I give it a good washing, let it dry, and put it back!!! But I too look forward to the day I can spent eternity with her and dad sitting at the feet of Jesus,,,,,♪♪ What a Day that will Be ♪♪!!!! Loved this post of yours!! !